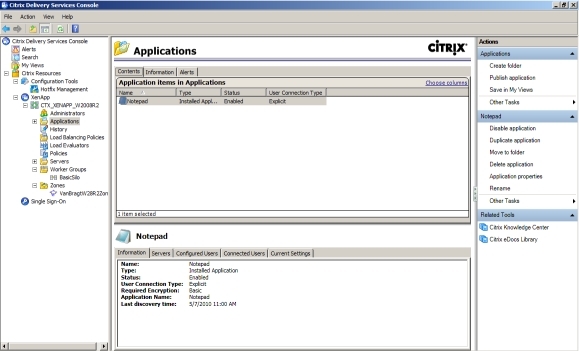 On the 24th of March 2010 Citrix releases XenApp 6 also known as XenApp for Windows 2008 R2. In this article I will review this first Citrix version available for Windows 2008 R2. Notice that this XenApp 6 also will only run on Windows 2008 R2 (so no Windows 2003 or Windows 2008 R1 support). (Logically) I will focus on the most interesting new features and how already existing features have changed. For more information on other non changed features check the reviews of earlier reviews of Citrix XenApp/Presentation Server on this website. 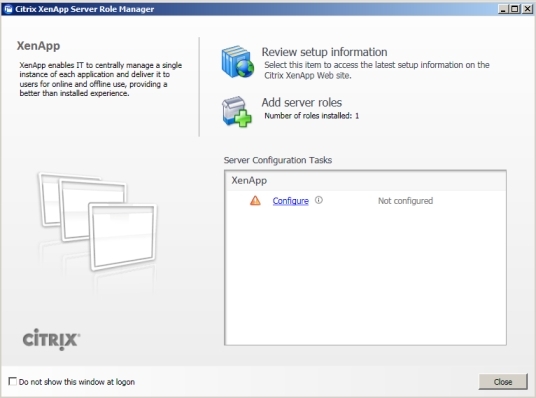 One of the major changes it the installation process of the XenApp server. The software still needs several additional components (Visual C++2005, Visual C++ 2008) to be installed, happily those components are now automatically installed (or a question appears on the screen where you asked if you would like to install the component). The installation is based on the Windows 2008 (R2) roles and features installation process. This approach creates a very quick and easy installation with no additional questions. Citrix did a nice job in simplifying the installation, mainly because during the installation no configuration is done (like connecting to the Citrix datastore). After the installation the configuration wizard automatically appears. This wizard needs to be used to create the Citrix Datastore (Create Farm) or join an existing farm. Previously different Citrix XenApp farms could co-exist in one farm (and thus one datastore), however XenApp 6 does not support this. You need to create a new farm when you install the first XenApp 6 server. The wizard includes the configuration items which were previously available during the installation like specifying the farm name (when creating a farm), database location (or creation with SQL express), zone settings and so on. After the configuration wizard a reboot is required. After the reboot the server is available for configuration and hosting user sessions. In this review I first will summarize the features which were already available in the previous version and focus if changes are available to these features. Because of these change also the unattended installation has changed, but the above described steps can still be accomplished using command line tooling for silent installations. Yes, you are reading it correctly. Finally Citrix managed to deliver a single console for managing a XenApp farm. Well still there is another console for VMHostedApps and the License server, but the actual XenApp tasks are now available within a MMC 3.0 based console (no java console anymore). Logically the name has been changed again, the console is now labeled Citrix Delivery Services Console. Also new to the console is that the actions available for that specific component are available in a new pane at the right showing the possible actions. Also the several views are now available as tabs instead of a text option in the previous. I'm pretty happy with this new console, because it's easier to use and more obvious. Within Published Applications two small changes are available. The first one is the possibility to choose 32 bit as a color quality, secondly you can assign a published application to a worker group. Both are new features which I will discuss later in this review. Except that Load Balancing is now moved to the MMC console, no new additions have been made to this component. There is kind of new component called Load Balancing Policies described in the new features section. Just as in XenApp 5 for Windows 2008 Resource Manager and Installation Manager are not available anymore in the default XenApp environment. Resource Manager Tasks are added to Citrix EdgeSight. With XenApp 5 for Windows 2008 installation manager tasks were moved to scheduled tasks, if this is this is the case for XenApp 6 is unclear because it is not mentioned anywhere and also on the DVD I cannot find anything corresponding to this. Lot of changes to this component. The policies are now integrated within Active Directory Group Policy Objects. The policies can be created and configured both using Group Policy Managed console and/or directly out of the Citrix Delivery Service Console. 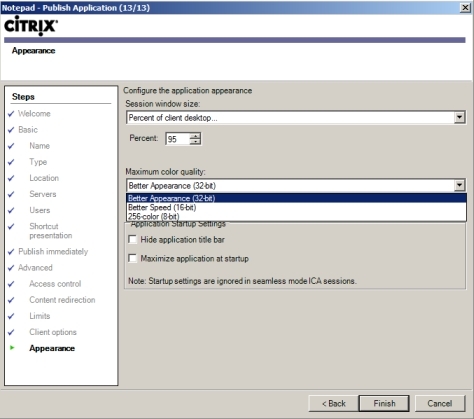 With the embedding of the policies Citrix also moved almost all configuration items to this component. Personally I think this is good move, because settings are now combined in one item. However it's strange if you choose the farm properties the first time and the only thing that can be configured is the database for configuration logging. The policies are logically now divided in two parts: computer and user. Within the computer part you can find the settings, which were first configurable as server/farm properties. But also some other new settings are available. 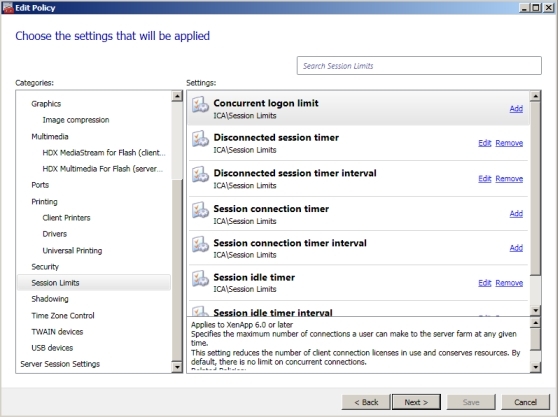 The same applies to the user configuration, where you will find several new features (finally the session idle and disconnect timers can be configured here. As stated you can configure the settings using two methodologies, you should remember that the location stored is not the same. Policies created using the Citrix console are stored within the Citrix datastore, while the GPO object are stored within Active Directory. Basically Citrix advices to use the GPO option (with the advantage that the settings are not bound to a single farm, but are applied to the machines/users in the specific OU/domain), but if you don't have a AD available (or does not have the rights to create GPO's) you can set the same policy set using the Citrix console. I will probably write a new article about this policy part in the near future, because this is a big change to the product. In comparison with other version Application Streaming has not change dramatically, but some new features where high on the wish list. For example the product now supports services isolation and raderun officially supported for starting the virtualized applications (so the application does not have to be published within the management console). Other new features are support for Windows 2008R2, Office 2010 32bit and change of packaging of the virtualized application (no cab files anymore). Citrix still support the Secure Gateway, also for this XenApp release. Also a new minor version of the Web Interface is added (5.3), but no specific new features worth mentioning. The license console is optimized, supports now more browser types and provides more information about the licenses. The technique for loading the profile is completely changed within XenApp 6. Citrix now postpones the loading of the profile after the logon process is finished. While the user already can start working the profile will be loaded in the background or when the data is needed (can be configured how these should be treated). Also changes made to the configuration are changed immediately in stead of saving the setting when the user logoffs the session. In this version also the differences between XenApp 5 for Windows 2008 and XenApp5/Presentation Server 4.5 or combined in one release, so this release also have the preferential load balancing, special folder redirections of Windows 2008 and features introduced in Feature Pack 2 for Windows 2003. If you combine this no big changes are made to features like configuration logging and health monitoring. Besides above mentioned improvement XenApp 6 offers several new features. In the press releases Citrix is mentioning several features as new while those are not specific related to XenApp 6 like the Citrix Receiver for several smart phones (like the iPhone, Android and so on) , Citrix Dazzle and new plug-ins within the Receiver. In this review I will only mention those features which are only available when running XenApp 6, because above mentioned "new features" can also be used with other (previous) XenApp versions. This new feature is not mentioned a lot, but this one is one of my favorites. With worker groups can create a group of XenApp server (based on a OU, AD Group or XenApp Farm servers). This workgroup can be assigned to policies, Load Balancing Policies and published applications. When you add a new server and assigns this one to the worker group it automatically will be configured using the policies and host the published applications configured. This feature is based on the Worker Group and is mainly a replacement of the Failover Zone Preferences. Based on several filters you can assign a session to a specific worker group, where you can configure more worker groups as a back-up. With XenApp 6 it is also possible to stream App-V virtualized application to client running the Citrix Streaming Client/Receiver. It's a remarkable choice by Citrix to support this, because it competes directly with Citrix Application Streaming. Probably many customers asked for this, because App-V is already more accepted than Citrix Application Streaming. This feature was one of the major points in the announcement of XenApp 6 (and also within the Feature Packs of XenApp 5/Presentation Server 4.5 for Windows 2003). For many parts this is current technology with a new name (think of speedscreen, ICA compression and progressive display). But in XenApp 6 there are several new features added to the HDX component. The first one is called HDX RealTime which improves audio quality to CD quality level (based on new codecs), VOIP echo cancellation and support for Microsoft Office Communicator (LAN based only). It's important that this feature is only functioning with a Windows client and the latest Receiver. Also within HDX dynamic USB plug and play support is added. This makes it possible to add USB devices into the client, while the user has already a XenApp session running (in previous version, you should logoff and logon again). Think of USB sticks, webcams, microphones, scanners, cameras and more). This feature will be loved by many end-users. Within Windows 2008 R2 Microsoft did a great job on multiple monitor support, so XenApp can use this for leveraging their multi monitor support (application position is persistent. Citrix also introduces 32 bit color support including DirectX/Direct 3D support. With this release Citrix is support Windows 2008 R2, which is definitely a good cause because offers a lot of good functionality that can be used to leverage XenApp. It's a pity that this version is only available for Windows 2008 R2, because it offers a nice set of new and improved features. 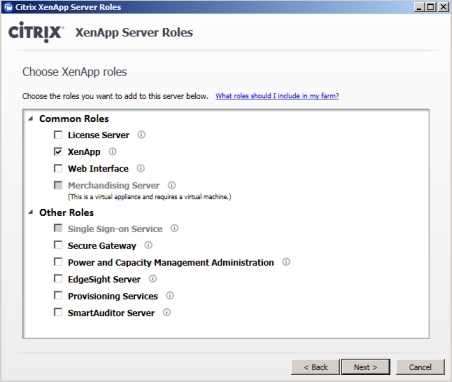 These features enhance the product both for the XenApp administrators as the end-users. So it's much easier to convince the people to migrate to this new version (in comparison with XenApp 5 for Windows 2008, but keep in mind that this is 64bit only). I personally think it's a pity that Citrix marketing machine for XenApp 6is concentrating on the self portal and Citrix Receivers for smart phones, while this is not actually a XenApp 6 feature (you can use this for all previous XenApp version also). Marketing machine is not focusing on "real" new features and also HDX is not actually the "fairytale" Citrix is telling.